Top Corporate Bollywood Dancers in Manchester! 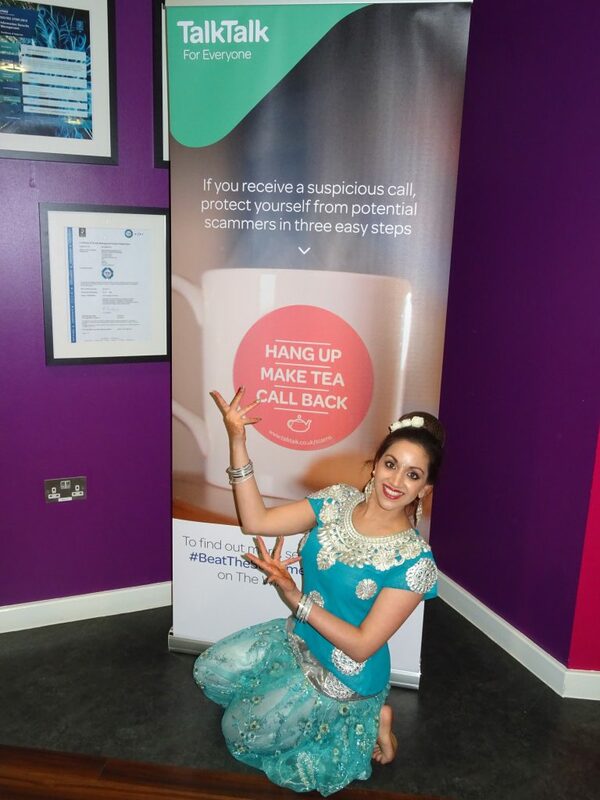 In 2013 as well as 2016, the Talk Talk offices in Irlam, Manchester, invited Ri Ri’s Dance Academy to entertain their employees for their Diwali party. With amazing credentials, Ri Ri’s Dancers are the top Corporate Bollywood Dancers in Manchester! Diwali, abbreviated from the Sankskrit word Deepavali, literally translates to a ‘row of lamps’. Hindus light lamps or candles during Diwali as a mark of celebration of good over evil and the light itself is a symbol of positivity and eternal hope. After fourteen years in exile Lord Ram, Goddess Sita and Lakshman return to their hometown, Ayodhya. This momentous occasion is highlighted every year through the celebration of Diwali. During the festival of Diwali, celebrated by Hindus, Henna painting, eating beautiful Indian cuisine, exchanging presents, designing colourful Rangoli patterns, visiting the Mandir (temple), decorating diyas and, of course, dancing are all part of the festivities! Three of Ri Ri’s national television female Dancers performed a number of stunning fusion Bollywood dance performances, including a number of styles such as the classical form of Ballet. The creative pieces were enhanced further by the outstanding, eye catching, costumes ornamented with sparkle and glitter – Simply perfect for the occasion of celebration! Although non Asian dance forms such as Ballet, Street Dance and Jazz were incorporated into the performances, the Bollywood beat and Indian music was consistent to which the Dancers performed too, purely adding a twist to the dance mix, yet concurrently keeping it traditional, too. This concept not only supplemented a little surprise for those watching but it appealed to a much wider audience, capturing the hearts of the Western audience, as well. Talk Talk, in 2016, requested an interactive Bollywood Dance workshop, as part of their Diwali party, from renowned Celebrity and Guinness World Record breaking choreographer, Ria Meera Munshi. The Talk Talk team were certainly not shy to get involved and have fun on the dance floor with Ria!